3. Verlin Tuck Ison b 9 Feb 1920 Isom, Letcher Co KY d 25 Mar 1995 North Vernon, Jennings Co IN; (served in WWII in Italy); m. Martha Blair. 5. James B Ison b 13 Feb 1924 Letcher Co KY d 1 Feb 1945 Limbert, Netherlands, WWII; age 21 years from wounds received while captured by Germans on Oct 6 1944. 6. Denver Ison b 10 Jan 1926 Letcher Co KY (or 28 Apr 1926) d 6 Feb 1949 Detroit, Wayne Co Michigan; buried Presbyterian Church, Isom, Letcher Co KY; (served in WWII in Germany); m. (1) Joy Fay Ables b 1927 d 2008 Letcher Co KY; Children of Denver Ison and Joy Fay Ables; i. James Doyle Ison b 2 Jul 1947 ii. Denver Ison b 28 Jul 1948. Joy Fay Ables m. (2) Robert Bobby Fuller; s/o Green Fuller and Leona Smith. 8. Mattie Jean Ison b 4 Sept 1928 Letcher Co KY d 6 Dec 2014 Jeremiah, Letcher Co KY; m. Gay Frazier. Mattie Jean Ison m. (2) Lewis B Day Jr b 8 Sept 1938 Perry Co Ky d 13 May 1991 Nashville, Davidson Co TN; buried Old Hickory, Davidson Co TN; s/o Lewis Day and Lizzie Unknown. Tribune - December 22, 2010. 1934 - 2010. Mary M. Caudill, 76, Brownstown, passed away at 10:30 a.m. Monday, December 20, 2010, at her residence. Mrs. Caudill was a member of Ratcliff Grove Christian Church and was a homemaker. Born October 9, 1934, in Red Foxx, Kentucky, she was the daughter of Burnett and Tina Blair Ison, both of whom preceded her in death. On April 23, 1955, in Red Foxx, Kentucky, she married Larry O. Caudill, who preceded her in death. Survivors include one son, Don Caudill, Bedford; one daughter, Dara Tormoehlen, Indianapolis; four sisters, Mattie Frazier and Margie Caudill, both of Jeremiah, Kentucky, Minta Koloski, White River Junction., Vermont, and Martha (Jack) Taylor, Jeremiah, Kentucky; three grandchildren, Scott Tormoehlen, Nathan (Christy) Tormoehlen and Erica Tormoehlen; and four great-grandchildren, Camron Caudill, Emalee Goss, Owen Tormoehlen and Tyler Tormoehlen. She was preceded in death by one grandson, Shane Caudill, and seven brothers, James, Danis, Denver, Van, Clyde, Verlin and Steve Ison. Ken Jergens will conduct funeral services at 1 p.m. Thursday at Spurgeon Funeral Home Inc., Brownstown. Burial will take place at Valley Home Cemetery. Friends may call from 11 a.m. until time of service Thursday at the funeral home. Mrs. Tina Ison of Isom, Ky., received a Telegram May 7th, that her son Pfc. James Ison died in February from wounds. He was twenty-one years old and the son of Burnett and Tina Ison. He Volunteered fro service April 13, 1942. He was stationed at Ft. Knox, Ky., for a time, then went to Fort Meade, Md., then overseas June 20, 1944. 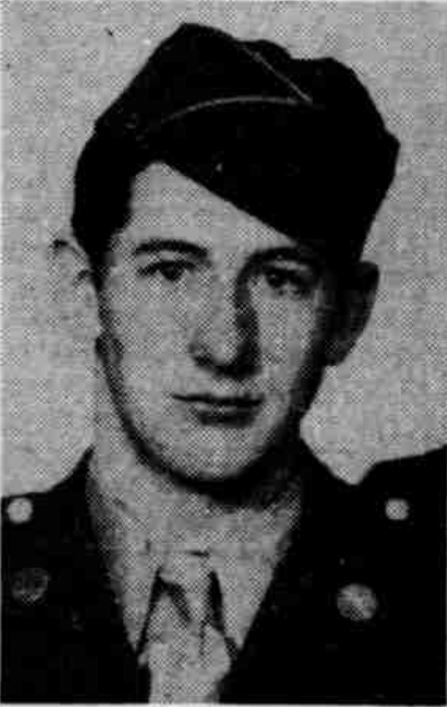 After four months in Holland he was captured by the Germans Oct. 6, 1944. He has three brothers in service, all overseas: Verlin in Italy; Clyde in Belgium and Denver in Germany. He is survived by five sisters and one small brother and his mother along with many other relatives and friends.